As the name suggests, "Ayinger Ottobrunn - Das Wirtshaus am Rathausplatz" is located in the centre of Ottobrunn next to the town hall. 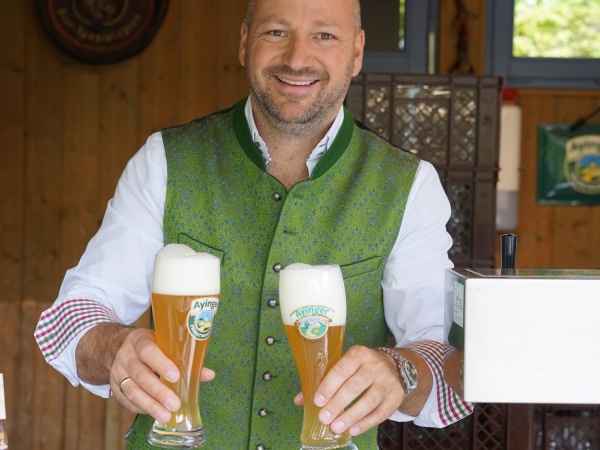 The innkeeper couple, Markus and Melanie Grenzdörffer, runs restaurant and beer garden since 2013. The self-service area of the well-kept beer garden is clearly separated from the served terrace. Depending on the season, between 500 and 1,200 guests will find place in the beer garden. Beside traditional beer garden benches there are also regular tables and rustic wooden benches with backrests. Numerous, still quite small red and white blooming chestnut trees provide shade on sunny days. Those, who are still feeling too warm can sit under one of the large Ayinger sun umbrellas. Kids can let off steam at the playground or on the meadow with a maypole adjoining the beer garden. The food stall offers cold and warm meals, among others Obatzda (Bavarian cheese specialty), sausage salad, meat jelly as well as Hendl (roasted chicken), rolled roast, spare ribs and chicken wings. 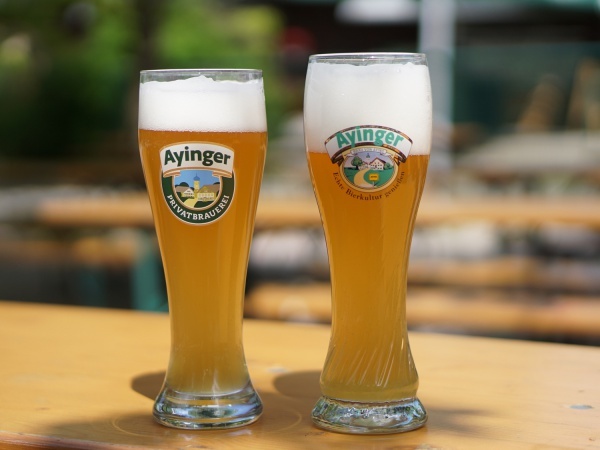 At the drinks stall there is freshly tapped Ayinger from the barrel. A Maß Hell (lager) costs €7.20 (April 2016). On the menu of the restaurant guests can find Bavarian and Austrian meals. Always on the first Sunday of the month there is a family brunch with a generous buffet. Festivities of all kinds can be celebrated in one of the themed restaurant rooms. There are also seminar rooms and five bowling alleys in the building. 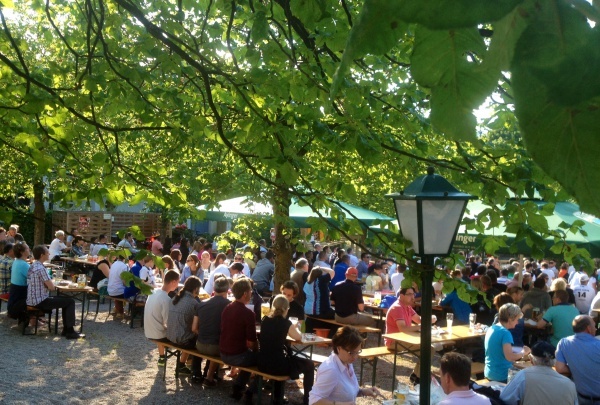 If the weather is nice the beer garden is open from Monday to Friday from 4pm and on weekends and public holidays from noon. This page was last modified on 18 May 2018, at 18:54.